Austin (pics) is the capital of Texas, home to the University of Texas and, interestingly, it is the third largest capital city of the United States. Some other capital cities like Atlanta, have a smaller population within their city limits but are part of a much larger metropolitan area. The current Texas Capitol building was completed in 1888. It was built to replace a much smaller building that had burned seven years before. 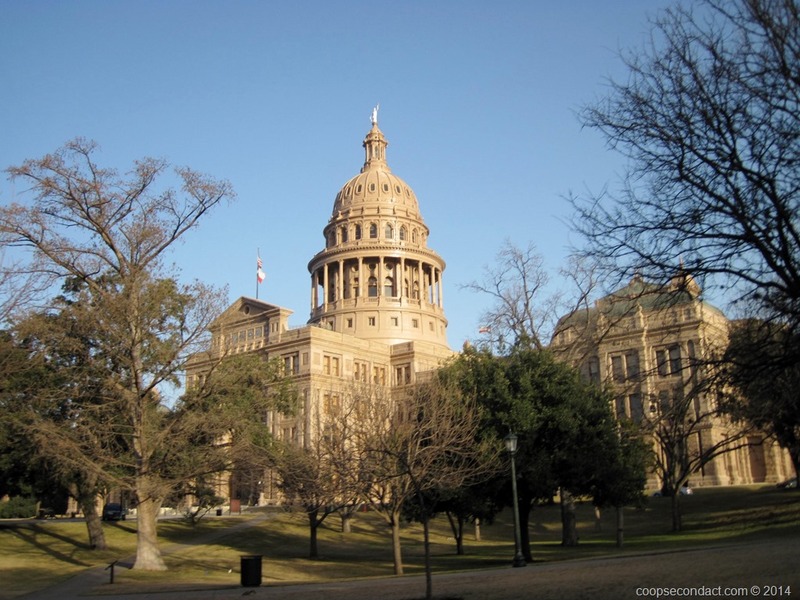 The Texas legislature had already begun to plan for a larger building even before the fire made it necessary. The Rotunda has a portrait of every person who has served as President of the Republic of Texas or as governor of the State of Texas. The most recent are hung on the ground floor and are rotated upward when a new one is added. In 1993, a $75 million, four story underground expansion of the Capitol was completed which contains twice the square footage of the main building. There is no evidence of the addition at ground level other than extensive skylights which are largely camouflaged by shrubs. We enjoyed visiting Austin very much. There’s the lovely campus of the University of Texas, some very nice historical buildings from the late 1800’s, especially along Congress Avenue and the beautiful Driskill Hotel. 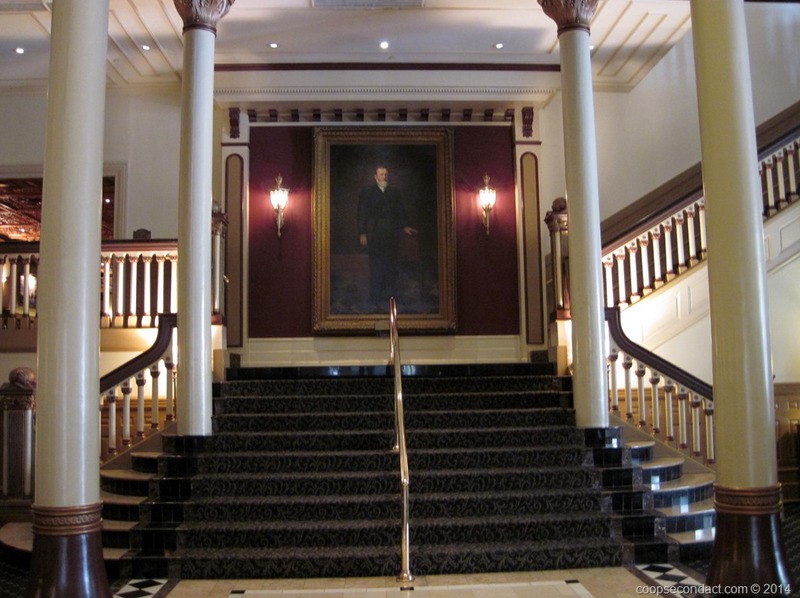 The Driskill was built in 1888 by cattleman Jesse Driskill. He was forced to close it after only one year when faced with losses from his cattle operations. The hotel changed hands many times throughout the years. President Lyndon Johnson and his wife, Lady Bird met for their first date here and visited it often. It was saved from the wrecking ball in 1969 when a non-profit organization was able to raise the funds needed to purchase it. Today it is owned and operated by Hyatt Hotels. 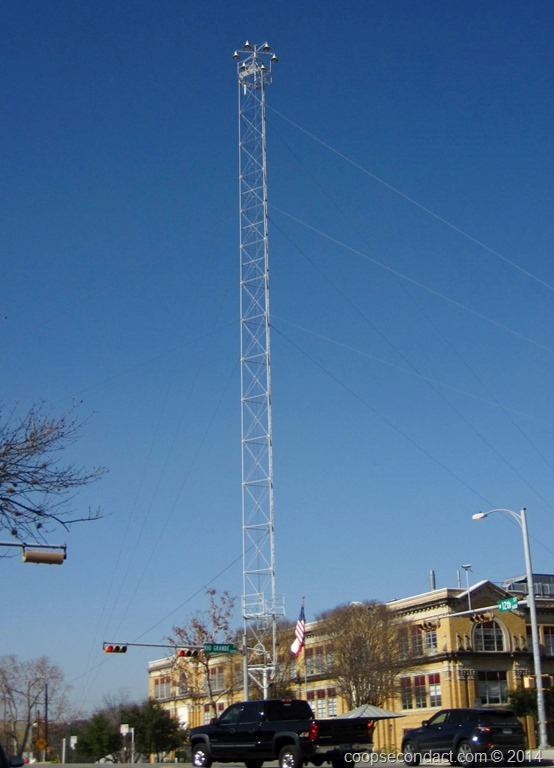 Austin is perhaps the only city in the United States that still has “Moonlight Towers” in operation. These late 19th century light towers were early forms of urban electric lighting devices replacing or supplementing gas lamps. These towers stood 165 feet tall and could illuminate a 1,500 foot radius circle with the light from its six carbon arc lamps. In 1894, the City of Austin purchased 31 of these towers and today there remain 17 with 6 of them in their original locations. You may be aware that Austin touts that it is the “Live Music Capital of the World” and plays host to a very important music festival. Ground zero for Austin’s music and food scene is a stretch of East Sixth Street in downtown. You also have lots of choices along Red River Street and the area referred to as SoCo, South Congress Avenue. 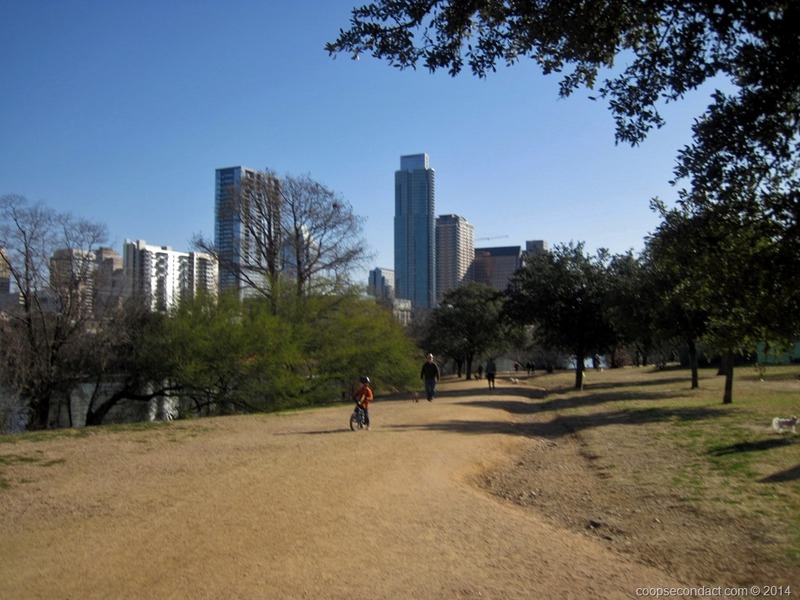 When you need to get outdoors for some exercise, head to Lady Bird Lake. Originally called Town Lake, it was formed from a section of the Lower Colorado River that runs through Austin. It has been dammed on both ends for flood control and to provide a constant level body of water for recreation. There is an extensive hiking and biking path along both banks. 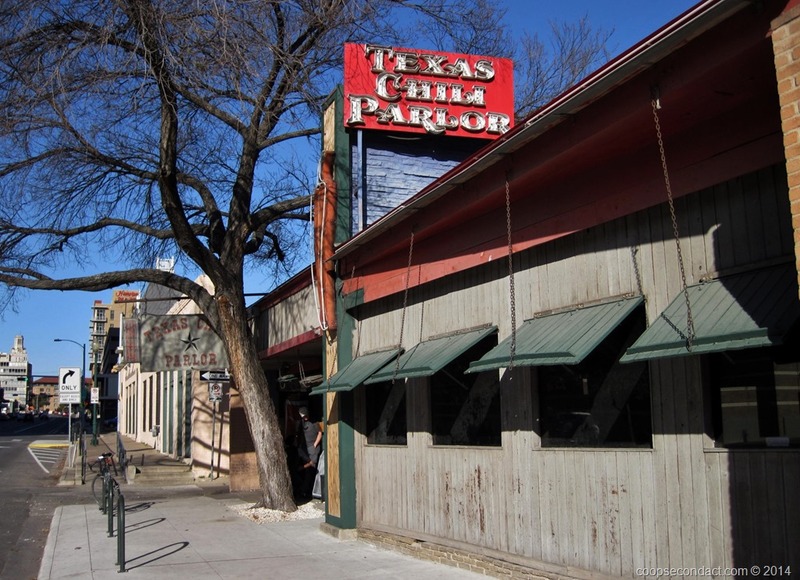 As for food, when we felt the need to experience Texas chili, we found the Texas Chili Parlor and though they may be short on amenities, they delivery on the chili. When we asked around about where we should go for barbeque, one of the places recommended was Home Park which has the oldest smoke pit in Austin. We were quite pleased with this choice. Finally, a bar on East Sixth Street named Casino el Camino is known to have award winning hamburgers. It’s been quite some time since we had hamburgers but again, this is a rare opportunity to experience special foods from different places. We had their Amarillo burger which was one of the finest sandwiches we’ve ever had. It was perfectly seasoned, perfectly cooked and perfectly topped with roasted serrano chiles, jalapeno jack cheese and cilantro mayo. If loving it is wrong, I don’t want to be right.